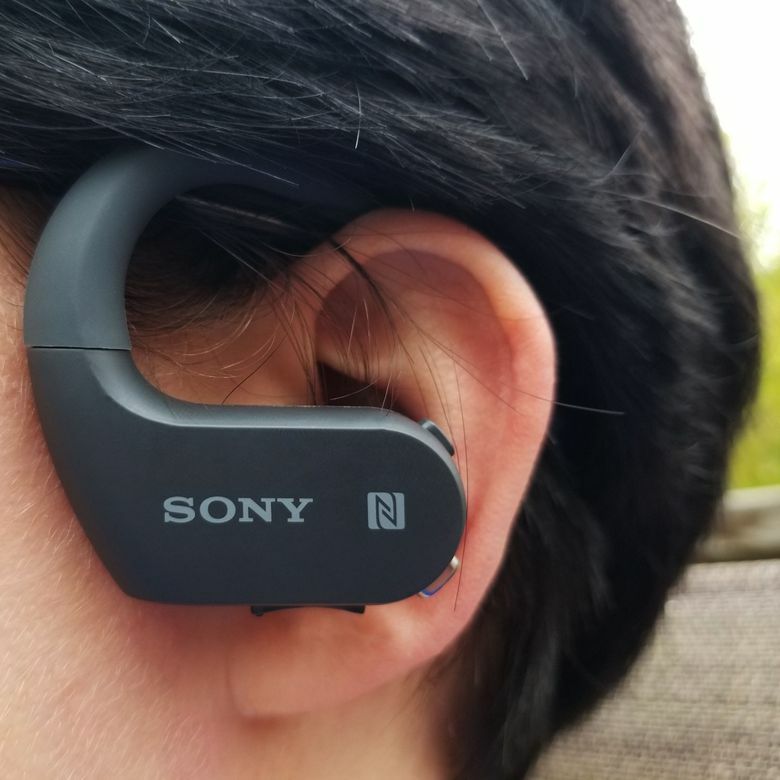 The Sony Walkman NW-WS623 is a feature-rich combined headset and MP3 player for the active user with an aesthetic that stands out among its peers, albeit the fit isn’t the most comfortable. It’s hard to believe the Sony Walkman brand is still around, but here Sony is with the NW-WS623. It’s a feature-rich, wearable MP3 player that’s on the expensive end compared to its competition. Fortunately, Sony backs up that price tag with a varied and impressive amount of features and modes, as well as a killer battery life. But there’s a dark side to such opulence: This headset is uncomfortable, rigid, and sometimes downright unpleasant to even put on. The Walkman NW-WS623 is an attractive looking headset, with curved earpieces that remind us of a sports car. But don’t let the cool looks fool you, this combo headset/MP3 player is durable and tough, with a matte finish that withstands scratches and being dropped. The buttons for changing volume, activating Ambient Mode, and other features are distinct and we were able to quickly memorize their functions. All that said, the cord connecting the two earpieces are quite short, measuring in at around seven to eight inches. While they always fit, we found them to be a bit tight around our head (which admittedly, is larger-than-average). Our preference would have been for a longer cord, but it’s far from a deal breaker. Having worn the Walkman NW-WS623’s through weight lifting sessions, laps on a treadmill, and just general use, we feel confident in saying that they’re just not comfortable. All of the provided eartips—including the smallest ones and the waterproof plugs—were a struggle to fit in comfortably. More than a few times we struggled to get the earpieces in, made worse for glasses wearers. Admittedly, the headset never fell out during our hours of use, but we were also very aware of them being on, and wondering if a specific movement would potentially cause a pop-out. They were most comfortable during weightlifting sessions, especially in lieu of traditional wired headphones. Part of this trade-off in comfort is for the impressive nature of the IPX5/8 rated waterproof, dustproof headset. It’s capable of spending half-an-hour of submerged time in 6.6 feet of saltwater. While not enough for a deep dive, the NW-WS623 are perfectly suited for the beach, a surf swim, and a post-workout shower. Make no mistake, this headset is far more rugged and versatile than its looks let on, especially considering their ability to withstand temperatures as low as 23 degrees Fahrenheit and as high as 115 degrees. They also easily roll up to go into a pocket or bag, taking up as little real estate as possible. We opened the NW-WS623’s from their package mere moments before heading to the gym. Fortunately, Bluetooth and NFC One-Touch pairing is a snap. We did run into some complications attempting to connect the headset to our Mac Mini’s Bluetooth, which required a few more minutes of effort. The NW-WS623’s pump out clear, crisp sound while never feeling overwhelming. Especially of note, is the strong bass that comes through in all circumstances. Their snug nature comes in handy by blotting out background noise effectively. Fortunately, with the press of a button, you can enable Ambient Sound mode which uses a microphone to pick up all the sound around you. It was a nice change of pace not having to take out our eartips just to hear someone ask us if they could have a turn on the squat rack. The NW-WS623’s pump out clear, crisp sound while never feeling overwhelming. We also found the MP3 player benefitted from the Samsung Galaxy S9’s equalizer settings, allowing us to tamp down the loudness by picking flatter EQ settings. At maximum volume, the NW-WS623 can be a bit too loud so this was nice found. Finally, it’s worth noting that the onboard storage supports a wide range of file types, including MP3, WMA, AAC-LC, and L-PCM music files. The functionality of the headset’s Bluetooth is smooth and we had no trouble using the on-earpiece buttons to navigate our Spotify playlist. Playing onboard music from the internal storage (4GB or 16GB) felt a bit clunky at times, but we were able to get used to it quickly. The wireless range was strong and held up even in the concrete-lined walls of our basement gym. Placing our phone on a shelf near the door, we were able to go anywhere around the gym space, which was an approximately 40 x 40-foot room. The signal even persisted when we went out into the hall to grab some water, all without losing any quality. Sony’s projected 12-hour battery life is spot on, not that you’ll ever need to let it get that low. The headset boasts a three-minute charge time to provide an hour of playtime, making it easy to top them up in the proprietary charging hub before getting ready to head out the door. That said, we disliked the fact that the charger was proprietary since it ended up being just one more tiny piece of plastic to keep track of. Sony’s projected 12-hour battery life is spot on, not that you’ll ever need to let it get that low. The NW-WS623 is certainly one of the most expensive options in the waterproof, wireless headset category. That said, we think the number of features and design choices—especially its dustproof, waterproof capabilities—highlight why they’re so much more expensive than the $50 to $80 dollar range of its competition. While there are options for those looking for a waterproof device that can go deeper than six feet, those devices lack the feature set of the Walkman. The added in durability also highlights that you’re getting the most feature-rich device in-class. The NW-WS623’s lack any direct competitor that possess all the features that the Walkman does. In fairness, all of those other devices check in at almost half the price, so direct comparisons are difficult. Other all-in-one headsets, such as the Tayogo Wireless 8GB earphones, feature the same level of waterproof capabilities in a seemingly precarious, around-the-neck holster for around $90. The Kalinco IPX7 Bluetooth headphones are sweatproof and boast eight hours of battery life, but lack onboard storage and, frankly, don’t look particularly durable. Sweeping feature set but high probability of discomfort. The device impresses thanks to a durable, sleek design, outstanding battery life, and quality of life features—particularly the ambient Sound mode that makes your gym workout a more tolerable. All that said, their supposed ergonomic design isn’t always the most comfortable and often reminds the user of their existence via jostling, pokes, and prods. Product Dimensions 5.1 x 2.3 x 7.4 in.